According to the Bhagavad Geetha, the body and life in it are based on food and sustained by food. However great and learned a person may be, however much he pays attention to the teachings of the Vedantha and takes care to spread them, if he neglects the strict code laid down for the food, he cannot succeed spiritually. The food we eat is an important constituent of the physical and mental stuff we have to struggle with, in the spiritual field. Purity of food leads to purity of mind. We should partake food with a Sathwic mind. Our ancestors recommended the offering of food to God before partaking. However impure the food maybe, when it is offered to God, it gets purified and nourishes us both physically and mentally as Divine prasad and Grace. Food so partaken becomes prasad (consecrated offering). Three types of purities are said to be necessary with regard to food. These are 1. Pathra Shuddhi (purity of vessels): The vessels for cooking must be clean and pure. 2. Paka Shuddhi (purity of the process of cooking): The process of cooking should not bring impurities. The person who prepares the food and serves must not only be clean in dress, but clean in habits, character, and conduct. He should not allow his mind to dwell on wicked or vicious ideas. 3. Pachaka Shuddhi (Purity of food materials): The provisions used for cooking has to be pure and of good quality. They should have been procured by fair means. The absence of any of the above three qualities makes the food impure. Impure food results in an impure mind. Hence it is necessary to purify the food before we eat. Now it is not possible to ensure the purity of the cooking process, since we do not know what thoughts rage in the mind of the person who prepares the food. Similarly we cannot ensure cleanliness of the food ingredients, as we do not know whether the seller who had sold it to us acquired the food grains in a righteous way. Hence it is essential on our part to offer food to God in the form of a prayer, so that these three impurities do not afflict our mind. When we make the offering to God, all the three types of pollution are destroyed and the food is turned into Prasad, which will nourish us physically, mentally and spiritually. 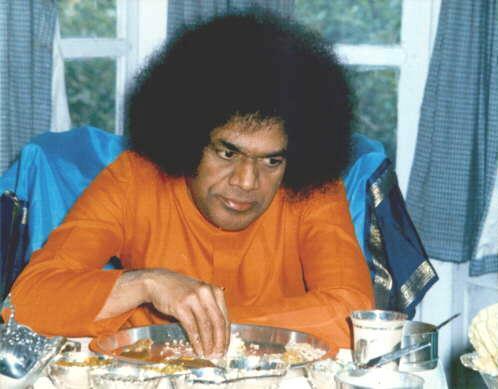 Bhagavan Baba says that we should not forget this important discipline of offering food to God with a prayer. This should be done even when we eat outside our homes (it may be done mentally if required).